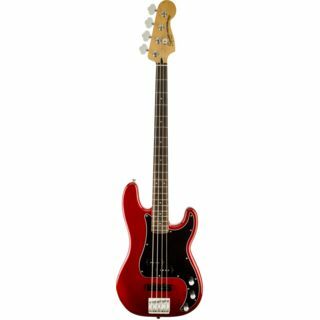 The Squier Vintage Modified Precision Bass PJ in Candy Apple Red is a four-string bass guitar based on the Fender Precision, but with both Jazz and Precision pickups. The Squier Vintage Modified Precision Bass PJ features an agathis body in the classic double-cutaway Precision body shape, decorated with a Lake Placid Blue finish and a three-ply black pickguard. The neck is made of maple and cut with a modern ‘C’-shape neck profile for a comfortable playing experience. The neck is topped with a rosewood fingerboard, offering a 9.5” radius and 20 frets with dot inlays. The Vintage Modified P-Bass PJ is fitted with a Fender-designed Single-Coil Jazz Bass pickup in the bridge position and a Fender-designed Split Single-Coil Precision Bass pickup in the middle position, providing both Jazz and Precision sounds, ideal for most musical genres. The pickups are controlled by dedicated Volume controls and a shared Master Tone control for dialling in your perfect sound. The Squier VM P-Bass PJ has a four-saddle Standard Vintage-style bridge with single groove saddles and Standard Open-Gear tuners, which promote stable tuning.